Urgenthomework.com is the most appropriate place for all those literature students who want to score well in the examination and also expand the horizon of their knowledge and mind along with not missing the fun of college life. 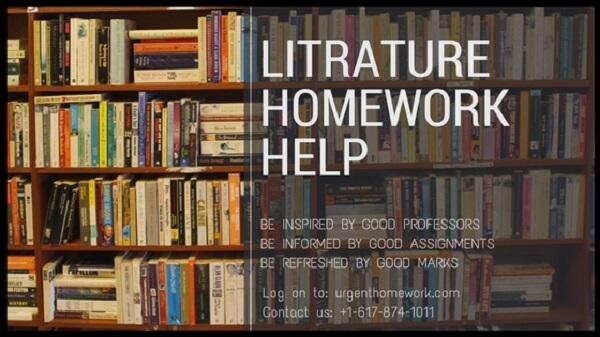 This education portal offers a marvelous way out for the students in the form of Literature Homework Help through which any student of any university, college can seek help regarding their homework, projects or assignments. Often the students wonder why it is necessary to seek online help for a relatively simple subject like Literature. Well, even if it seems easy, Literature is not that simple as the students have to critically analyze the study materials and produce original, creative answers which can’t be gobbled up. The students often have the tendency to save the literature assignments for the last time which makes the work soon piled on. The main aim of reading literature is to enlighten the readers as literature is supposed to be the reflection of society. Apart from the society, literature is not just literature oriented. It has its connection with several other subjects like Psychology, Political Science, History, and Comparative Literature and so on. This makes it more problematic and complicated since a literature student should know a little bit of everything if not in greater details. Problematically not every student has the ability to critically analyze everything, nor do some of them know how to write a good literary essay. In a class full of people a teacher cannot give personal assistance to each student and some of them may not have the same intake capability, hence it is advisable to seek online help. This particular education portal has trained professional tutors to provide help regarding any literature, especially English and World Literature. Through 24*7 availability and live chat system, the students will be able to gain the personal assistance which they cannot have in a class full of students. The website also provides the students the golden opportunity to prepare in a better way through Mock tests or reviewing the submitted literature homework of the students. The students will learn how to identify and critically analyze the texts, the themes, plot or characters. Beginning from grammar and composition, we take care of everything including poetry, drama, novels, essays, creative writing and so on. More over all of the assignments, projects or homework will be plagiarism free, well researched and well debated and done within the given deadlines. Thus we are willing enough to help the needy students through our Literature and English literature Homework Help services in every best possible way we can along with boosting up their confidence through the interactive discussions.